Certain incenses are reputed to help with spiritualism or talking to the dead. How do I actually use these resin incenses to help me talk to the dead? I got the Gum Arabic. Do I need Dragon Blood resin along with it? Do I need a charcoal disk? Those are good questions. Let me try to answer in a way that will help you both with the use of those incenses and with Spiritualism and talking with the dead. First, you will need a charcoal disk on which to burn resin incenses such as Gum Arabic and Dragon's Blood. They are twoo dense to burn on their own under normal circumstances. You will need a heat-broof incense brazier or pot and it should be lined with clear sand. You may prepare it first by copying out a verse from the Bible on the subject of incense, burning the paper to ashes (this is your hand-copy, not an actual Bible you are burning), and rubbing the ash inside the incense brazier, then pouring in the clean sand. Light the charcoal and when it is glowing (just like at a barbeque) slowly drop onto it crushed fragments of the resin. Smoke will arise and you should observe the smoke. It will often (not always) reveal faces or shapes of spirits. If it does, speak to them. Always test the spirits to see that they are of God and goodly in nature. The Devil can mimic the dead, so be careful. If you see no images in the smoke, don't worry. Just ask for the one with whom you seek contact, by name, to appear to you in voice if not by sight. Most people cannot contact the dead directly, but they do see spirits in the smoke or hear their voices. Ask any spirit whom you contact to go and bring back to you the spirit of the dead one with whom you wish to converse. Many Spiritualists report that they cannot contact the dead directly, but that they see Spirit Guides who offer to bring you the one you want as a service to the living and the dead. They will bring the one whom you seek. An equal-part mix is fine. Can I do spells just using incenses. What can I do to be process by my deceased friend. What incense powders and resin I need for cleansing, protection, to get my wife to be obsessed and extremely in love with me forever. What I need for to dominate over her. And to get a side girl. And yes, there are incense spells. 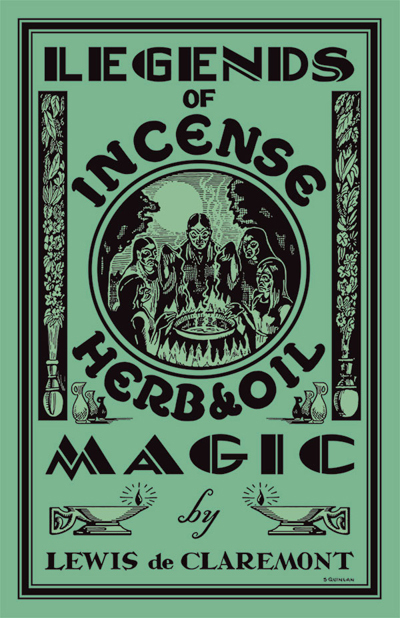 Legends of Incense, Herb, and Oil Magic by Lewis de Claremont, first published in 1936, now, on the 80th anniversary of its publication, restored and re-released to the public as part of the Lucky Mojo Curio Co. Library of Occult Classics. I'm looking at using quite a large quantity of incense for an outdoor project. I'm thinking of combining the total amount of four separate condition incenses and lighting it. 4oz of incense is quite a bit, so I"m going to try some practice runs before I do the actual deployment. I want to see how the burn is with a significantly larger quantity of incense, also in an outdoor setting, with minimal wind. Temperature is also something I'll be observing. I'd like to use a disposable, temporary container before anything too. I've thought of a type of larger paper-type Solo cup; not anything plastic either. I have never heard of burning incense on such combustible stands. I use metal. It is safe. Especially the censers that are designed to withstand the heat. What should I do with peaceful home incense resins? I don't have a back yard to bury it in. Can I throw it outside the window where I live?? I do not believe that Lucky Mojo sells: "Peaceful Home Incense Resin"
Is it possible/how would it be possible to take loose LM incense and make it into stick form? Do you ever think you'll make your incenses in stick form? I'm assuming you asking because you don't want to have to burn them on charcoal - remember, if you have a candle snuffer, just pack it full of incense and give it a gentle tap and you got yourself a cone incense! If your crafty you can make something like a Vantine cone shaper by cutting an aluminum can too (be careful though, metal can be very sharp!)! Hope that makes it a little easier to use loose incense! If you're open to working with incense in cone form instead of stick form, RevJames gave you some good advice! thanks for the advice. I'm looking for stick form incense specifically however. I was wondering if I could fumigate a bottle of cologne in incense in order to put it to working much like I would do an amulet or piece of jewelry for a specified effect or outcome. Yes, you could, and some folks suffumigate or cense all of their altar tools before use -- but this is a personal choice. Hey there all you DIYers! I have been making my own loose incense, which I typically burn on charcoal. The only problem with this method is that though it is wonderful if I am doing spellwork out of doors, it is way too smokey and cloudy for indoor use. I would really love to learn how to make small incense sticks or cones, especially now that winter is coming. I have read a bit online about how to do this using tragacanth or arabic gum, but I haven't tried it yet. Has anyone actually done this? I would really love to hear more about tips and tricks, method and such. I really want to make incense sticks or cones that will burn nicely and evenly. I also want to make sure that I am not using anything that might be toxic. Lucky Mojo sells a self lighting incense that does not need charcoal to burn it. It works very well and is not overly smoky. You can also crack a window after burning it to limit the smoke. I also sometimes using a ceiling fan to move the air. As for making I do not have experience with that. I hope to see some post that may help with that for you. I am fine with the level of smokiness one gets from incense sticks and cones. Mainly I want to be able to turn my own home made powder incenses into something I can burn indoors. How do the self-light incenses work? Does anyone know what the key ingredient is that makes them work? Since you are not asking about the purposes or uses of our Lucky Mojo products, but rather want to learn more about the way incenses are made, i would like to recommend that you join one or more of the many online communities dedicated to incense-making. They can be found on various social platforms. Thanks Cat! And apologies if I stepped off topic on this-- that was not my intent! JayDee, I was looking at the incense , I came across inflammatory incense,and influence incense are they good to use? Are is it to much and if it’s not to much do I just need the incense? Are the oil to? All the incense products sold by LM are good to use. The type of incense used should corespond to the work you are doing. If I am cursing i would use inflammutory, or crossing, jinx, destruction. If I am doing love work I may use come to me, fiery love, love me. If I am cleansing I may use uncrossing, blessing, jinx killer. If I am doing spiritual work, such as alter work I may use a resin blend, or one that meets my spiritual desire. Many workers use the incense, oil and powders. Incense carries the prayer, it also is a sweet aroma to God, it pleases the spirit, oil is used to dress physical items that, powder is dusted on items that oil would not work on, used to sprinkle in a yard, foot track, or on candles. You can use the products combined or alone. I suggested in the alter topic, as you are just getting started with an alter work area to consider buying an incense that address: attraction, repealing, cursing and luck. this way you can use them with various workings. As time progresses expand into more options to increase your knowledge and experience. The best way to learn is to take the item and interact with it. JayDee thanks again for answering the incense questions, your so help all of you guys on this whole site I love it! One thing I have learned is that incense is sometimes easier to mix with dirt than sachet powders. The scent and herbs are there, but the colors are duller and blend into the ground better. ConjureMan Ali mentions on the Lucky Mojo Radio Show burning incense and scattering the ashes mixed with dirt for footprint magic, which is great idea too. So incense powder is more than just .... incense. Question, how long does a full packet of incense burn after being made into a cone? Like pour an entire packet into a big cone and do the thing Catherine taught in that page and burn it. The way to use the incense powder is to make several cones out of the contents of the packet and burn them individually. There is no telling how long it would take to burn all of the incense at once. I imagine it would be very smoky to do so, when you would not overwhelm yourself or your space with smoke if you burned smaller cones. I read a long time ago about using tobacco with a skull candle to "speak" to your target. I finally got the tobacco powder and I was wondering if I could use it with any candle? and perhaps a honey jar one? I want to get a friend to hurry with contacting me (I know he will, it's just taking time...), and I have a honey jar for him already. The idea with tobacco is you are puffing it into the face of a skull candle which represents the person, you are then making them think of what you are saying and doing. You can do the same thing with any of the lucky mojo incenses they sell, wave or gently blow the smoke into the face of the skull candle or photo as you state your petition. Yes a taper or chime candle can be used as well, but you do lose the physical element of having a skull in front of your face that you are talking to. You can use any color that seems to fit best, yellow communication, white general, purple to dominate. Many workers dress the candles in oil after it is inscribed with a petition such as : John Doe Contact Jane doe .. then dust it with powder, this is double dressing a candle.